Lowers Utility Bills - Homeowners with GeoExchange systems see energy savings on average of 25 to 50 percent over traditional gas, oil or heat pump systems. A typical 2000 square foot home can be heated and cooled for as little as $1 per day. Produces Free Hot Water - Unlike any other heating and cooling system, a geothermal heat pump can produce hot water for free. Excess heat is transferred from the heat pump’s compressor to the hot water tank. In the summer, hot water is free; in the winter, water heating costs are cut by about half. Produces Environmentally Friendly Energy - The EPA and the US Department of Energy recognize geothermal systems as the most environmentally friendly way to heat and cool a house. Unlike other heating and cooling systems, geothermal does not emit carbon monoxide, carbon dioxide or other greenhouse gasses that contribute to air pollution. 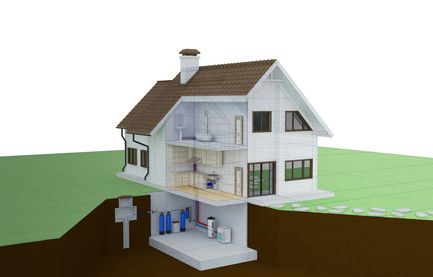 Creates Positive Cash Flow - Geothermal is an investment that can be tied to your mortgage payment or other low interest finance option; it will produce significantly cheaper utility bills and annual maintenance costs. These savings will easily cover the increase in your loan payment giving you extra cash flow. A geothermal unit usually pays for itself within 3 to 5 years. Try this Geothermal Savings Calculator to see the estimated savings for your home. Provides Clean and Safe Energy - Geothermal heat pumps don’t use fossil fuels (natural gas or propane); thus, there are no threats from combustion such as carbon monoxide poisoning. Provides Consistent Comfort - Geothermal systems heat and cool homes evenly, eliminating blasts of hot or cold air found with conventional systems. Geothermal also dehumidifies the air during hot summer months. Operates Quietly - Unlike air conditioners and heat pumps, geothermal units operate quietly, and there is no unsightly outdoor unit to disturb you or your neighbors. Has a Long Life Span - Geothermal systems typically last more than 20 years if properly maintained. They require little or no maintenance beyond periodic checks and filter changes. Since a geothermal heating and cooling system could be the biggest investment you make in your home, thorough research is important to determine if this system is right for you and your situation. The upfront cost is quite expensive, but the long-term savings, as you can see, is huge (especially if you live in an extreme-weather environment like Montana).